Nardelli Futura Custom - "excellent....."
Retrovibe Basses Super-P - "Worthy of the name Super"
Epiphone Thunderbird Classic-IV Pro - "Top choice for the price"
Squier Vintage Modified Jazz Bass - "Nice tone and well made but a little heavy bass." 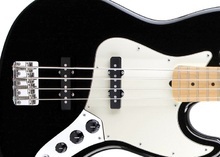 Squier Vintage Modified Jazz Bass '77 - "Fender sound without broke my wallet"
Typhoon TY B11 - "would like two pickups, its got a great neck, a bit neck heavy, i will mod it to my end use." Hofner Guitars Ignition Bass - " Avoid ..."
B.C. Rich Mockingbird ST Bass - Tobbaco Sunburst - "I like it but don't "love" it"
Fender Classic '60s Jazz Bass Lacquer [2014-2017] - "Fantastic vintage tone, great look and feel." Squier Classic Vibe Jazz Bass '60s - "Buy it!"